Got A Small Business? 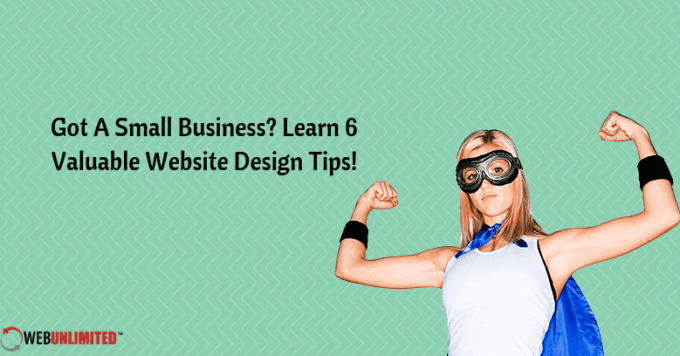 Learn 6 Valuable Website Design Tips! A great business web design is an important tool to ensure your business succeeds today. Business website design is somewhat different than other types of design; however, its main focus is to present your company in a positive light and convince customers to convert. Ensure success with your website by learning some details on how business web design services create sites that bring in traffic and turn it into customers. The first rule of success with any business web design is that it has to be user-friendly for your intended audience. It should have an uncluttered, organized look, easy navigation, and all the links and content that your users would expect to find on your website. Happy users will stay on your site longer, increasing the possibility that they will convert. Your company’s purpose and the purpose of your business website should be plainly obvious when users click onto it. Users should be able to determine what your company does and what you are offering them from the moment they land on your homepage. Trust is one of the most important factors for businesses competing online today. Business web design services recommend that you show users that your website is safe by prominently displaying security and trust badges. Testimonials from actual customers also go a long way to build trust in your business. Over 60% of users are more likely to do business with your company if they see testimonials from others who have trusted you and had positive results. Images, video, and other media content in your business website design are a great way to attract attention and break up lots of textual content that can lose viewers. It can also make your site more visually pleasing, provide information in a more easily consumed format, and make your textual content more scannable and understandable. Professionally shot video and imagery also help build credibility as users can see that you are serious about helping your customers and providing the information they need to make informed decisions. No matter what it is that you want your users to eventually do on your website, make sure your business web design has a clear and obvious CTA. Making users search for where to buy or sign up will simply reduce your conversion rate, as users click off instead of clicking in further. Show them where you want them to go with bold, contrasting buttons and instructive labels so there is no mistaking it. Everyone likes to get something for free, so offering a freebie is a popular tactic used by many web design services to attract traffic and increase leads and conversions. Give out a sample product, a special white paper or ebook, or an attractive discount for signing up, making a purchase, or converting in other ways. Success with your business website involves thinking about more than just its aesthetic appeal; looks are important for business website design, but not everything. Using these tips implemented by the best business website design companies, you can make sure your great-looking site also performs well! Want Business Web Design In College Station Texas? Web Unlimited Can Create The Business Website Design You Need!